So a couple of people had asked me what the certificate is like, and so here is a picture of it. To say I treasure this is a bit like saying that I value breathing, or that I like beer, or I like Sunderland Football Club, or some other such ridiculous understatement. You will see on there, amongst other things, pictures of the Senecia and Impatiens that we saw on the mountain. 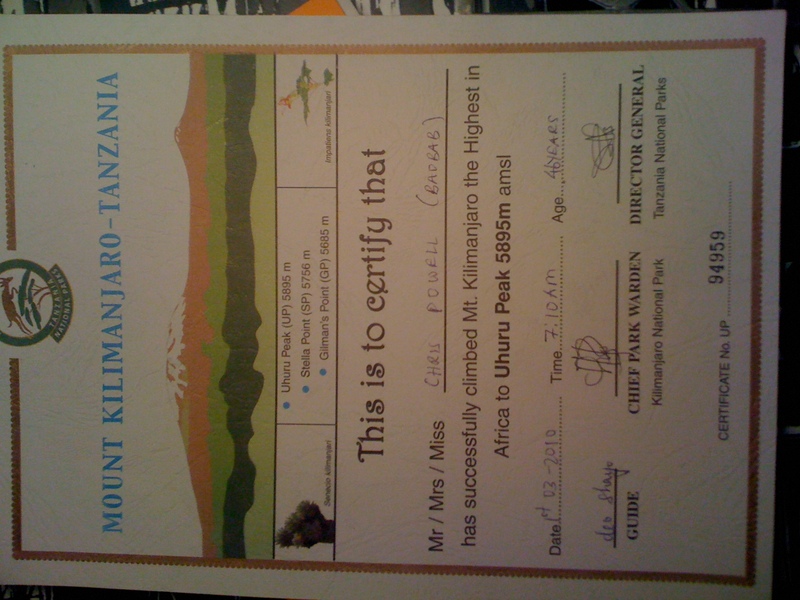 You will also see my Swahili name (I love being called that, and am considering having it tattooed somewhere, I mean seriously), and also the date and time of our summiting. The record here is also recorded in the big register at the Park Gate, for all time hopefully.